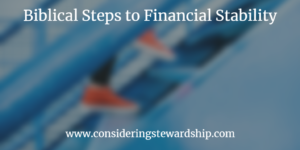 There are very simple biblical steps you can follow for financial stability. There are other steps that could be included but these are the most central biblically based steps everyone can try for. Col 3:23-24 Whatever you do, work at it with all your heart, as working for the Lord, not for human masters, 24 since you know that you will receive an inheritance from the Lord as a reward. It is the Lord Christ you are serving. One of the biggest steps in creating financial stability is to learn to work hard. I don’t mean physically working hard, but as the Bible says whatever you do, do it will all of your heart. While hard work alone is no guarantee of financial stability lack or of a good work ethic will almost certainly lead to instability. 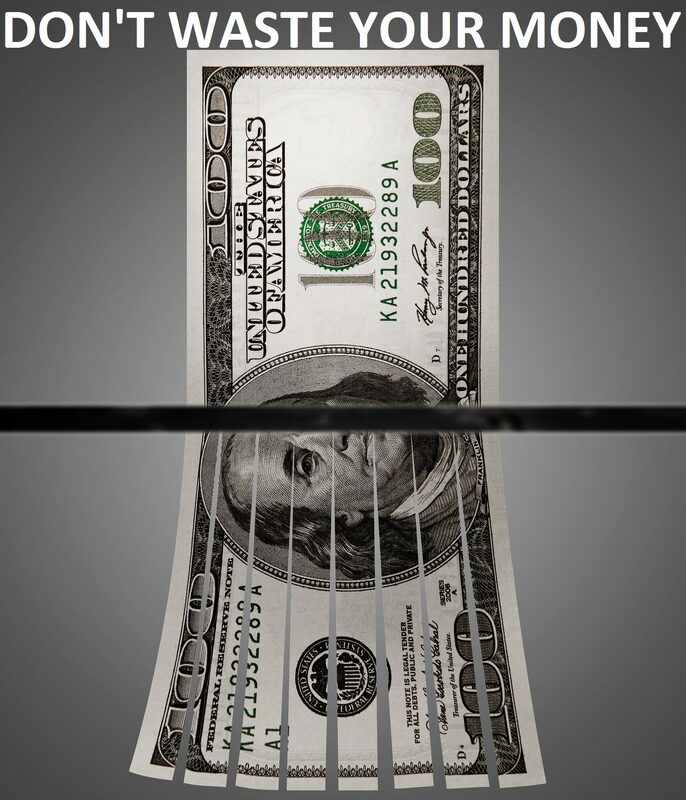 Prov 22:7 The rich rule over the poor, and the borrower is slave to the lender. If you are in debt you are serving someone else. While the Bible does not specifically prohibit debt, it does warn against it in many ways. We can not live long spending more than we make, we are not congress. Prov 6:6 Go to the ant, O sluggard; consider her ways, and be wise. Without having any chief, officer, or ruler, she prepares her bread in summer and gathers her food in harvest. How long will you lie there, O sluggard? When will you arise from your sleep? A little sleep, a little slumber, a little folding of the hands to rest, and poverty will come upon you like a robber, and want like an armed man. The ant prepares for tough times. We must know that emergencies come up, bad things happen and we need to be able to prepare for them. If we are not spending less than we make we will never be able to prepare for our own emergencies let alone help others with theirs. Deut 15:10 – Give generously to them and do so without a grudging heart; then because of this the LORD your God will bless you in all your work and in everything you put your hand to. This is a sermon from Proverbs on Christian stewardship. Jason preached at the Veritas Tri-village congregation on 6/12/2016. Christian stewardship begins with understanding that God is the owner of everything (Ps 24:1). Christians understand that we are bought with a price and that it is God who gives us the power to gain wealth (Deut 8:18). A good Christian steward, one who honors the Lord with their wealth. Heading off to college is a great adventure for many young people. I know it was for me so many years ago. It was my first time living on my own, 6 hours from my parents. I was very fortunate that my chosen school only cost a few thousand dollars a year for tuition. I was able to work full time and pay as I went. 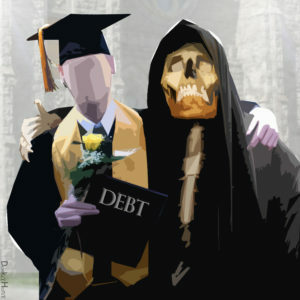 The only student debt I managed to accrue was because I was stupid with my credit card. College is a strategic inflection point for many young people. It is a time when many don’t get good council about money. A degree can take you far, but it can also become an anchor around your neck. Here are a few things to think about when you are entering college. Is student debt a good investment for me? Everyone is supposed to go to college right? But if you think about your student debt as an investment you can determine if it is right for you. I can’t tell you how many young people I have worked with who didn’t need to go to college. They trained for years only to discover they didn’t like their chosen career. 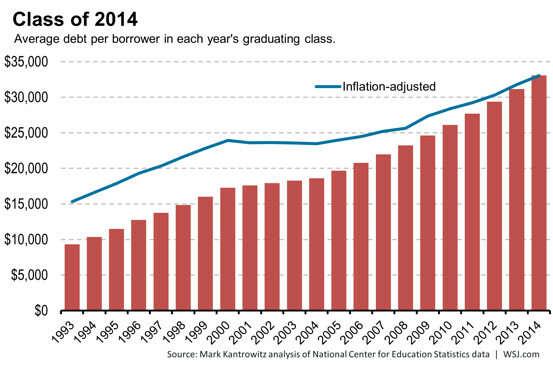 Now they have the student debt, but not the great job to go with it. 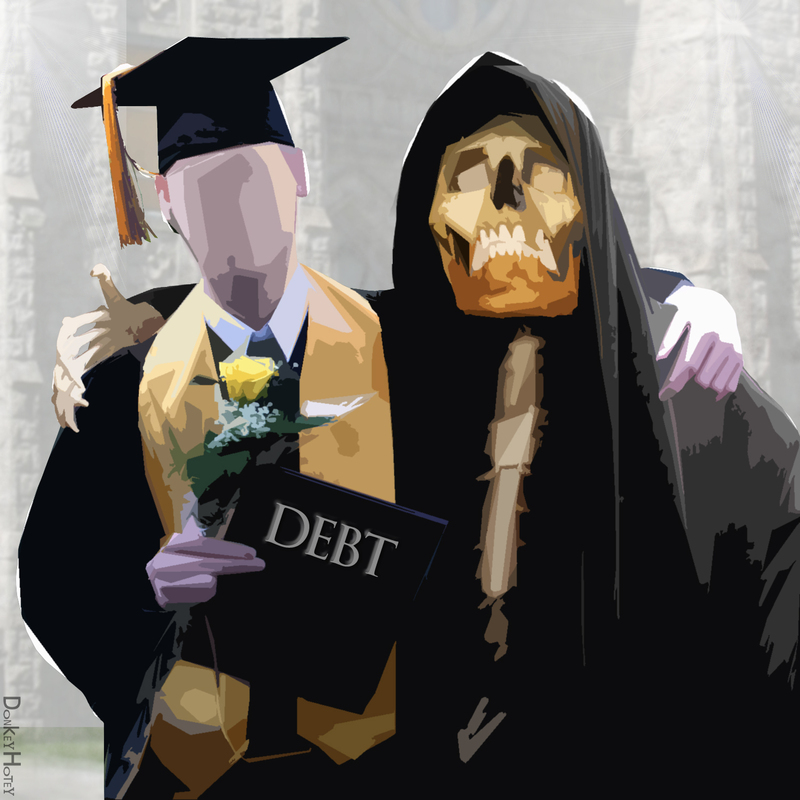 We are told in the scripture how dangerous it is to pursue wealth (1 tim 6:6-10), but it is foolish to pursue and expensive degree without the ability to pay it back the student debt. Jesus told us to count the cost of following him and we should count the cost of our education decisions as well. Many people consider their college years a right of passage, and to be sure many of us did our greatest growing and met our best friends and even our spouses (ring by spring of your money back) during these years. To be sure these years are very special, but that doesn’t mean you must pay a fortune to have these experiences. I don’t mind if people need time to “find themselves” and discover who they are, but it is foolishness to assume this must be done in a traditional college environment and can’t be done elsewhere. Will my job pay for my degree? I have talked with many recent grads. I ask them how they intend to pay off the student debt, which is larger than my mortgage, with a job that only pays $40k a year. This isn’t the barista job that they took because they couldn’t get employment in their field. This is the job in their chosen field. It is as if this thought has never occurred to them. Or worse yet, their thought is that someone else should pay it off because they are working in a “public” field. One should not complain when what fulfills your heart doesn’t fulfill your wallet. Is there another way to get this education or experience? When I started looking into colleges to become a pastor my advisers tried to talk me into schools costing $40k a year. (in 1997) I decided to go a small bible college where I could learn by doing just as much as I would learn in the class room. I took an internship in the youth department and I read all I could get my hands on. Do you think I am full crap or do I have a good point? Let me know in comments below. If you follow many bloggers advice you are throwing money away without even realizing they are doing it. Personal finance writers talk a lot about delayed gratification. That’s the ability to put off things that you want now for better things later. We tell you to save up for the things you want instead of putting it on a credit card because it will cost you less and it is better to not be in debt. Every personal finance writer worth their keyboard can tell you about the Marshmallow Test and how it shows a child’s ability to delay reward and how it links to later success. Often times when we are thinking about money we only get as far as this world. Saving for college, saving for an early retirement, saving for the new car or to get out of debt are all very good goals, but they are not the ultimate goals if you are a Christian. And far too often the people who are thinking about their money and being good stewards are still far to short sighted. If your 401(k) and your bank accounts and you houses look just like those of the people who are making the same amount of money as you then you are surely throwing money away where moth and rust may corrupt. Or worse yet you are heading down a path that Paul warns us is incredibly dangerous. Loving after money and desiring it can lead you to wander from the faith. We need to be aware of our own sinfulness and if we are one of these people who for whom money may cause our ruin, we should give it away all the more. Ask yourself today, am I being selfish with my money? Am I giving sacrificially as the Bible calls me to do? Am I trusting God to provide or am I trusting in my savings account? If you aren’t sure of the answers, ask your spouse or a brother or sister who will be honest with you. Let’s face it, this time of year even the best of us have a hard time fighting off Christmas materialism. 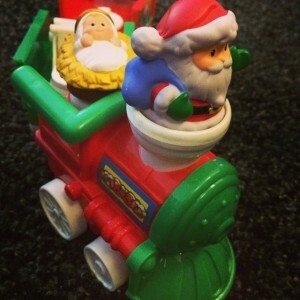 Christians have often allowed the secular marketing powers to dictate what is means to celebrate Christmas. Whether that is buying the newest and greatest toy for our kids (or ourselves) or forgetting what it is we are really celebrating. I want to put out a warning to us all, including myself to guard our hearts and direct them to the real purpose of the season. Do I love the lights, the songs, the traditions of Christmas time? Yes, I love seeing them through my kids eyes and seeing them anew myself. I love even more when those traditions push us toward Christ and away from the values of our secular society. Think about how you celebrate Christmas and what is communicates to your family and those around you. We celebrate advent, a church period starting at the end November and ending on Christmas. Advent means arrival and we do things during this time to help our family remind ourselves of the significance of Jesus birth. We have never done the Santa thing (we do love St. Nick). We give gifts not based on good works, but on grace. We have made sure our kids realize that this isn’t a time to “be good” but to realize you are bad and God loved you regardless and sent in son to die for you. We remind them of this with a Christmas Eve birthday cake for Jesus. We don’t want our girls to look at this as a jackpot time for themselves, but as a time of thankfulness and giving. We don’t buy a lot, but maybe more than many. We make sure they spend their own money to buy for each other and the girls we sponsor through Compassion International. I hope to protect them, at least a little, from the materialism that is so prevalent this time of year. Do we do it right? Not sure, but we are being intentional in our approach to the holiday. Being intentional and not allowing this time to run a muck is a great first step to fighting off Christmas Materialism. How do you guide your children and yourselves through this holy time of the year? Can I use reward cards? One of the questions I get almost every time I speak on stewardship is around the use of reward cards. You know, the ones where they give you rewards points or cash back for spending money through them. As a general rule I am against consumer debt, credit cards, car loans and the like, but there is always someone who asks me about using cards for the cash back or for the rewards. They feel they can game the system somehow and make the banks pay. My answer is as straight…absolutely depends. There are some folks who are diligent enough to pay off the card every month without fail. Those folks will make money from reward cards in the long run, but it doesn’t take much to ruin that streak and cost you all your winnings. Just like Vegas the house always wins. …consumers generally spend more and increase their debt when offered one percent cash-back rewards. The impact of a relatively small reward generates large spending and debt accumulation. On average, each cardholder receives $25 in cash-back rewards during our sample period. We find that average spending increases by $68 per month and average debt increases by over $115 per month in the first quarter after the cash-back reward program starts. We all assume we are the exception to the rule, but that is not often the case. Banks spend millions of dollars to analyze the results of the incentives they give. That is why make the profits that they do. I am not that person. I can do things if they are automatic. We use a reward card to funnel a few bills through that I automatically pay, but if I use it for anything else I end up paying interest even though I have the money to pay it off. I just like having the money in the bank more than not paying interest even though I know it is the wrong thing to do. However, if you pay off your bill every month without fail you can make a little extra money with a reward card. It may just be best to ignore the fact that it is a reward cad and not try to game the system or you may find that you are the one being played. 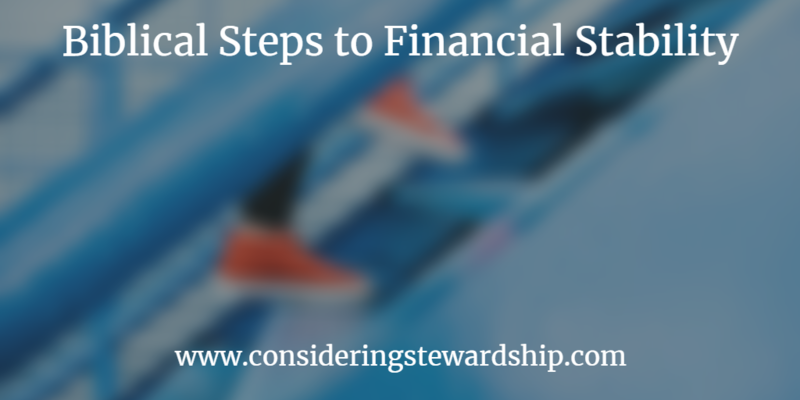 I started writing on Christian stewardship for several reasons. I came to faith in a part of Christianity that is what most would call the “prosperity gospel” or the “Health and wealth” gospel and I found myself disturbed at the way those churches taught people to handle their finances. They simply treated God like a get rich quick scheme. If you offered your money on the right alter God would make you rich. It was just that simple. I know families that gave everything they had to the church and when they needed financial help were basically told they needed to have more faith, but were given no help my the church. Then I started seeking wisdom in the world for financial advice. I read “Rich Dad Poor Dad”, “The Millionaire Next Door” and, still one of my favorites, “The Richest Man in Babylon.” These books had a lot of great financial advice but very little to say about how the Gospel should influence your money choices. I saw a great need in the church. A balance if you will between these two views. It seems to me as I read many personal finance articles even those written by Christians they still boil down to spend less than you make, get out of debt, save for retirement and give. And maybe that is enough, but it seems like there is really more to it than that. This blog has become a place for me to stretch out some ideas I have about what Christian stewardship is all about. I may get a little crazy sometimes, but I hope to find truth in the scriptures for regarding my money and my love of it. I recently read a similar post and it got me thinking about some of the Bible verses about money that we don’t like to talk about in the church. I suppose it depends on which end of the denominational spectrum you are from, but I selected a few that I think apply to everyone. Deut 14:22 –Those people who do talk about tithing take all their evidence from the Old Testament, and conveniently ignore this scripture that tells the believer to take their tithe and consume it is celebration of the Lord. If the temple is too far away the believer is instruction to sell their tithe take the money travel to the temple and “spend the money for whatever you desire—oxen or sheep or wine or strong drink, whatever your appetite craves. And you shall eat there before the LORD your God and rejoice, you and your household.” The tithe was meant to for the believer to celebrate the goodness of God, not just to be given to the temple. I was taught that if I didn’t pay my tithe on time I owed an extra 20%. So, the idea of using to throw a party to celebrate the goodness of God would be blasphemy. But my wife and I have put this in to practice and invited people to celebrate God’s goodness in our lives. 2. Prov 21:13 — “Whoever closes his ear to the cry of the poor will himself call out and not be answered.” Social justice is becoming trendy and many folks want to use government to force people to do what they believe to be right. I don’t find it possible to love my brother by putting a gun to his head and forcing him “do the right thing”, but I do think about how I can help those who are less fortunate. Not in the short term, but long term. How can I help to break the cycle of poverty. It is one of the reasons I teach people about money. 3. Luke 6:20 — “Blessed are you poor, for yours is the kingdom of heaven . . . Woe to you rich, for you have received your consolation” Smithsonian magazine had an article earlier this year showing that 90% of Americans consider themselves middle class. Most of us don’t think we are poor. When we hear this scripture we think we are the blessed ones, but Americans are the rich Jesus is talking to. We are the 1% from the world’s perspective. We, as a church and individuals, must do more in order to help our brothers and sisters. 4. 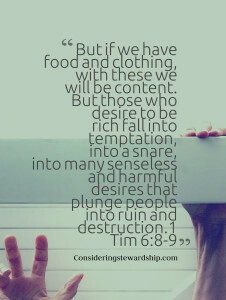 1 Tim 6:8-9 — “But if we have food and clothing, with these we will be content. 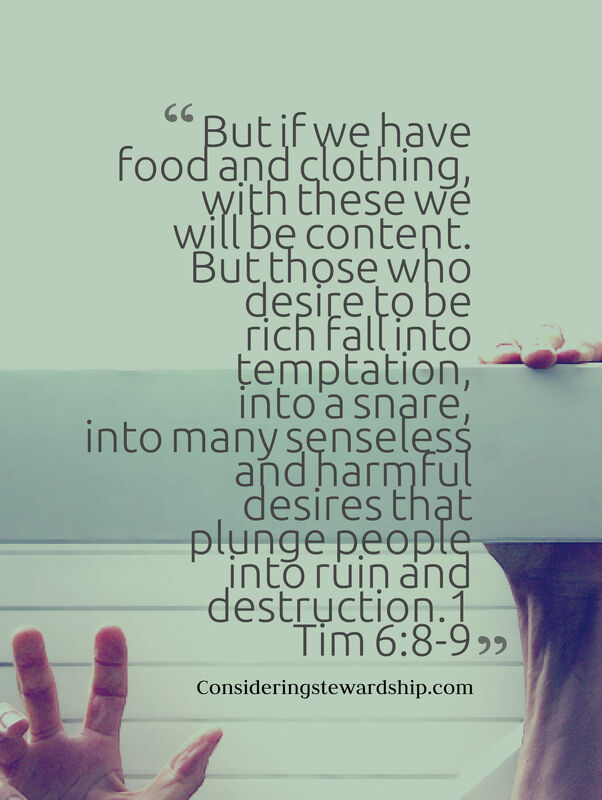 But those who desire to be rich fall into temptation, into a snare, into many senseless and harmful desires that plunge people into ruin and destruction.” We all assume we are not the one Paul is talking about. After all, I am not the one who pursues wealth, I just want to use money to promote God’s kingdom, of course I get to keep some too, that is beside the point. If we desire to be rich we will fall to many temptations don’t be fooled. This passage is directed at us all. 5. Luke 12:19-21 — “And I will say to my soul, “Soul, you have ample goods laid up for many years; relax, eat, drink, be merry.”’ But God said to him, ‘Fool! This night your soul is required of you, and the things you have prepared, whose will they be?’ So is the one who lays up treasure for himself and is not rich toward God.” This is the closest thing I have found in the Bible talking about the American idea of retirement. We want to sit back with our stored up treasure and eat drink and be merry. Rich toward God means more than giving him a small percentage off the top. 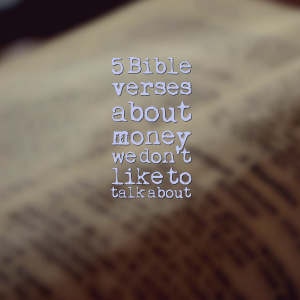 What other money scriptures don’t get enough recognition? Make sure you don’t miss an article, subscribe to our newsletter. Is Pursuing Christian Wealth Worth the Spiritual Risk? 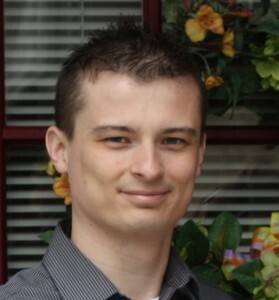 I read a lot of personal finance bloggers, many of them Christian. It seems to me that many of them ask “Can we?” in regard to Christian wealth, but rarely ask if we should. Dave Ramsey, for example, talks a lot about handling money God’s way. He says that God’s way will lead to having a lot of money that you can give away later after you are established. Very similar to the prosperity gospel I was a part of; the goal was always to get more money for the sake of God’s kingdom, but it would make us wealthy along the way. 1 Tim – But godliness with contentment is great gain,  for we brought nothing into the world, and we cannot take anything out of the world. But if we have food and clothing, with these we will be content. But those who desire to be rich fall into temptation, into a snare, into many senseless and harmful desires that plunge people into ruin and destruction. 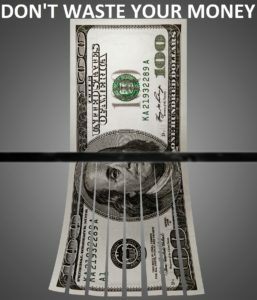 For the love of money is a root of all kinds of evils. It is through this craving that some have wandered away from the faith and pierced themselves with many pangs. Paul calls to be content with food and clothing because of the inherent dangers in the pursuit of wealth. Of course, we don’t pursue money for it’s own sake. Of all the Christians pursuing wealth, not one of them would say it is for their own sake. Paul seems to be warning a Christian that no longer exists in our day. We only want money for the good it can do, but Paul didn’t seem to be to concerned about our good intentions. He seems to think the risk wasn’t worth the results. The very thing we pursue with such vigor can tempt and draw us to destruction. Is it worth the risk? I know I am taking a hard stand and I would love to hear your comments below as I process this. I have often wondered if my choice to go back to school was a good one based on my situation. I was 32 and had no degree to speak of, but I was already deep into a career that required a degree. I was very fortunate to get into IT work during the boom when all you needed was a warm body and some aptitude. (which thanks to my parents getting me a C64 when I was 8, I had in spades) Did I really need to go back to school? Probably not, I took on some debt to do it although because of the program I was able to complete my degree in from 0-BA in two years. In working with a lot of college grads who are now turning to a bleak job market I have to wonder how much longer we will swallow the bitter pill of college. There are some careers are always going to need a degree, but it seems like apprentice programs and boot camps would serve many people better in the log run. If you are going to take out a small mortgage for a career that pays $30,000 a year it isn’t a good investment or good stewardship of your money. I hope things turn around before my girls are old enough to face this ever growing mountain of debt.